ในปี พ.ศ. 2518–2519 อามินได้เข้าดำรงตำแหน่งเป็นประธานองค์การเอกภาพแอฟริกา (Organisation of Africa Unity) ของขบวนการแพนแอฟริกาเพื่อสร้างความเป็นน้ำหนึ่งใจเดียวกันในทวีปแอฟริกา ตลอดปี พ.ศ. 2520–2522 อามินเรียกชื่อตนเองว่า "ฯพณฯ ประธานาธิบดีตลอดชีพ จอมพล อัล หัจญี ด็อกเตอร์[B] อีดี อามิน ดาดา, วีซี. [C], ดีเอสโอ., เอ็มซี., ซีบีอี., ผู้พิชิตจักรวรรดิอังกฤษในทวีปแอฟริกาทั้งหมดและผู้พิชิตยูกันดาโดยเฉพาะ"
ในปีนั้นอามินได้ทำการขับไล่ที่ปรึกษาทางทหารอิสราเอลออก และหันไปรับการสนับสนุนจากมูอัมมาร์ อัล-กัดดาฟี ผู้นำลิเบียและสหภาพโซเวียตแทนและออกมาต่อว่าอิสราเอลอย่างไม่พอใจ ในภาพยนตร์สารคดีเรื่อง General Idi Amin Dada: A Self Portrait เขาได้พูดถึงแผนการที่จะสร้างสงครามต่อต้านอิสราเอลขึ้น จะใช้พลร่ม, ระเบิดและกองทัพระเบิดพลีชีพ ภายหลังอามินออกมากล่าวถึงฮิตเลอร์ว่า "ทำถูกแล้วที่เผาทำลายยิว 6 ล้านคน"
↑ Ullman, Richard H. (April 1978). "Human Rights and Economic Power: The United States Versus Idi Amin". Foreign Affairs. สืบค้นเมื่อ 2009-03-26. 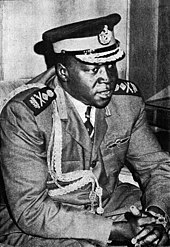 The most conservative estimates by informed observers hold that President Idi Amin Dada and the terror squads operating under his loose direction have killed 100,000 Ugandans in the seven years he has held power. ↑ 2.0 2.1 Roland Anthony Oliver, Anthony Atmore. Africa since 1800. p. 272. ↑ 3.0 3.1 Dale C. Tatum. Who influenced whom?. p. 177. ↑ Jørgensen, Jan Jelmert (1981). Uganda: a modern history. St. Martin's Press. p. 272. ISBN 0312827865. ↑ 6.0 6.1 "Idi Amin: a byword for brutality". News24. 2003-07-21. สืบค้นเมื่อ 2007-12-02. ↑ 7.0 7.1 Keatley, Patrick (18 August 2003). "Obituary: Idi Amin". The Guardian. สืบค้นเมื่อ 2008-03-18. ↑ 8.0 8.1 8.2 8.3 Guweddeko, Fred (12 June 2007). "Rejected then taken in by dad; a timeline". The Monitor. Archived from the original on 2007-06-12. สืบค้นเมื่อ 2009-08-08. ↑ 9.0 9.1 "Idi Amin". Encyclopædia Britannica. 19 December 2008. Archived from the original on 2009-08-09. สืบค้นเมื่อ 2009-08-08. ↑ 10.0 10.1 General Idi Amin Dada: A Self Portrait. Le Figaro Films. 1974. ISBN 0-78002-507-5. ↑ Bay, Austin (20 August 2003). "Why Didn't Amin Rot and Die in Jail?". Strategy Page. สืบค้นเมื่อ 2009-08-08. ↑ Bridgland, Fred (16 August 2003). "Idi Amin". Scotsman. สืบค้นเมื่อ 2009-08-08. ↑ "Country Studies: Uganda: Independence: The Early Years". Federal Research Division. United States Library of Congress. สืบค้นเมื่อ 2009-08-08. ↑ Nantulya, Paul (2001). "Exclusion, Identity and Armed Conflict: A Historical Survey of the Politics of Confrontation in Uganda with Specific Reference to the Independence Era" (PDF). Archived from the original (PDF) on 2006-10-04. ↑ 18.0 18.1 "General Idi Amin overthrows Ugandan government". British Council. 2 February 1971. สืบค้นเมื่อ 2009-08-08. ↑ "On this day: 25 January 1971: Idi Amin ousts Ugandan president". BBC. 1971-01-25. สืบค้นเมื่อ 2009-08-08. ↑ Fairhall, John (26 January 1971). "Curfew in Uganda after military coup topples Obote". The Guardian. สืบค้นเมื่อ 2009-08-08. ↑ Mbabaali, Jude (August 2005). "The Role of Opposition Parties in a Democracy: The Experience of the Democratic Party of Uganda" (PDF). Regional Conference on Political Parties and Democratisation in East Africa. สืบค้นเมื่อ 2009-08-08. ↑ 23.0 23.1 "Country Studies: Uganda: Post-Independence Security Services". Federal Research Division. United States Library of Congress. สืบค้นเมื่อ 2009-08-08. ↑ "An Idi-otic Invasion". Time. 13 November 1978. สืบค้นเมื่อ 2009-08-08. ↑ 27.0 27.1 "Obituary: Idi Amin". Daily Telegraph. 17 September 2003. Archived from the original on 2009-08-09. ↑ "Disappearances and Political Killings: Human Rights Crisis of the 1990s: A Manual for Action" (PDF). Amnesty International. Archived from the original (PDF) on 2009-08-09. ↑ "Special report: Who were Amin's victims?". The Daily Monitor. 13 June 2007. Archived from the original on 2007-06-13. ↑ Luganda, Patrick (29 July 2003). "Amin's Economic War Left Uganda on Crutches". New Vision. Kampala. ↑ "On this day: August 7th 1972: Asians given 90 days to leave Uganda". BBC. 1972-08-07. สืบค้นเมื่อ 2009-08-08. ↑ "Flight of the Asians". Time. 11 September 1972. สืบค้นเมื่อ 2009-08-08. ↑ "On this day: July 7th 1976: British grandmother missing in Uganda". BBC. 1976-07-07. สืบค้นเมื่อ 2009-08-08. ↑ "'Dada' always rubbed Kenya the wrong way". Sunday Nation. 17 August 2003. Archived from the original on 2008-02-06. ↑ "Purges and Peace Talks". Time. 16 October 1972. สืบค้นเมื่อ 2009-08-08. ↑ Orizio, Riccardo (21 August 2003). "Idi Amin's Exile Dream". New York Times. สืบค้นเมื่อ 2009-08-08. ↑ "Museveni, munificent with monarch". The Economist. 29 November 2007. สืบค้นเมื่อ 2008-06-27. ↑ Serugo, Moses (28 May 2007). "Special Report: The myths surrounding Idi Amin". The Monitor. Archived from the original on 2007-05-28. ↑ "Amin:The Wild Man of Africa". Time. 28 February 1977. สืบค้นเมื่อ 2009-08-08. ↑ Kibazo, Joel (13 January 2007). "A Brute, Not a Buffoon". The Guardian. สืบค้นเมื่อ 2009-08-08. ... Amin was widely portrayed as a comic figure. Yes, he had expelled the Asians and murdered a few people, but isn't that what was expected of Africa, I used to hear. ↑ "Obituary: Idi Amin". Daily Telegraph. 17 September 2003. Archived from the original on 2009-08-09. Throughout his disastrous reign, he encouraged the West to cultivate a dangerous ambivalence towards him. His genial grin, penchant for grandiose self-publicity and ludicrous public statements on international affairs led to his adoption as a comic figure. He was easily parodied ... however, this fascination, verging on affection, for the grotesqueness of the individual occluded the singular plight of his nation. ↑ 46.0 46.1 "An Idi-otic Invasion", TIME magazine, Nov. 13, 1978. ↑ "Not even an archbishop was spared", The Weekly Observer, February 16, 2006. ↑ "Fighting for Amin", The East African, April 8, 2002. ↑ "Idi Amin back in media spotlight". BBC. 25 July 2003. สืบค้นเมื่อ 2009-08-08. ↑ "Idi Amin, ex-dictator of Uganda, dies". USA Today. 16 August 2003. สืบค้นเมื่อ 2009-08-08. Amin was buried in Jiddah's Ruwais cemetery after sunset prayers Saturday, said a person close to the family in the Red Sea port city. The source, who spoke on condition of anonymity, was told that few people attended the funeral. ↑ 53.0 53.1 "Reign of Terror: The life and loves of a tyrant". Daily Nation. 20 August 2003. Archived from the original on 2008-02-06. สืบค้นเมื่อ 2009-08-08. ↑ Kavuma, Richard (18 June 2007). "Special Report: Big Daddy and his women". The Monitor. Archived from the original on 2007-06-18. สืบค้นเมื่อ 2009-08-08. ↑ 55.0 55.1 55.2 Kibirige, David (17 August 2003). "Idi Amin is dead". The Monitor. Archived from the original on 2007-06-10. สืบค้นเมื่อ 2009-08-08. ↑ Mcconnell, Tristan (12 February 2006). "Return of Idi Amin's son casts a shadow over Ugandan election". The Daily Telegraph. สืบค้นเมื่อ 2009-08-08. ↑ "Amin's son runs for mayor". BBC. 3 January 2002. สืบค้นเมื่อ 2009-08-08. ↑ "Idi Amin's son lashes out over 'Last King'". Associated Press. USA Today. 22 February 2007. สืบค้นเมื่อ 2009-08-08. ↑ "Idi Amin's son jailed over death". BBC News. 3 August 2007. สืบค้นเมื่อ 2009-08-08. ↑ Keatley, Patrick (18 August 2003). "Idi Amin: Obituary". The Guardian. สืบค้นเมื่อ 2009-08-08. ↑ "Amins row over inheritance". BBC News. 2003-08-25. สืบค้นเมื่อ 2009-08-09. The Idi Amin I knew, Brian Barron, BBC, 16 August 2003. Includes a video of Brian Barron interviewing Idi Amin in exile in 1980. หน้านี้แก้ไขล่าสุดเมื่อวันที่ 4 ธันวาคม 2561 เวลา 05:15 น.